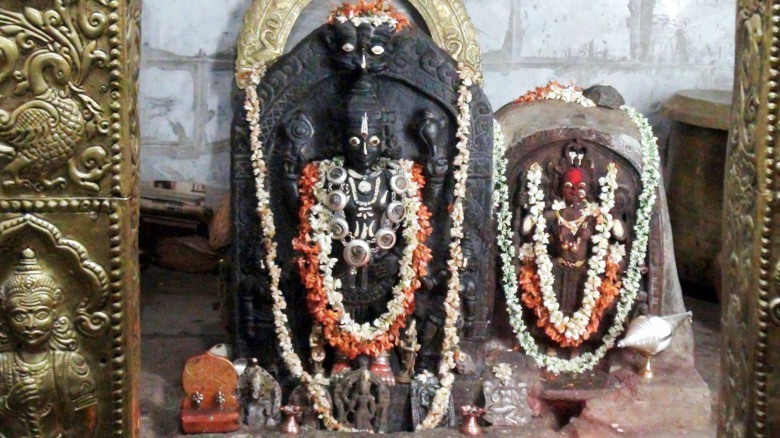 Srinivas acharya(Resident of Kallur), was a great devotee of Sri Kolhapur Mahalakshmi. Every year he visited Kolhapur during Navarathri time(8th day) and he offered Sandalwood(chandan) to Goddess Mahalaksmi. But due to his Age, He was not able to travel a long. He was so saddened as he was not able to visit Goddess as before. One day on his dreams, He got a strange dream. He heard the voice saying “I will come to see you in Navarathri”. Next day while srinivas acharya was performing his daily duties, He was recollecting the dream and was stunned on the words “I will come to see you in Navarathri”. Days passed by Navarathri came, Srinivas acharya was grinding chandan. The smooth grinding stone was hard at places. he did not pay too much attention but continued the grinding process to collect more chandan. Further he noticed that the roughness was becoming more and more. He took the chandan in a bowl and cleaned the stone. To his surprise He saw smiling face of goddess mahalaxmi was looking at him. The carved form of Goddess has actually caused roughness. Tears of joy filled his eyes. Kallur then attained the status of Karveerpura(Kolhapur). 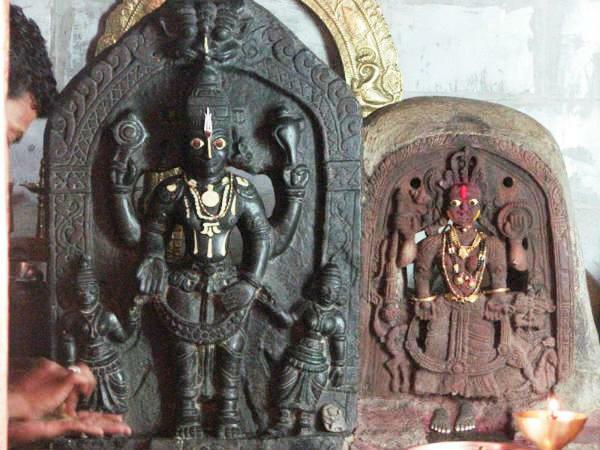 The pure bhakthi and dedication of Sri Srinivasa acharya brought mahalakshmi to his place. Miracles were happened, is happening and will happen. One can do chant 21 times any ista shloka everyday for 41 days.do pradaksine around photo.